The new Porta Mondial Real Estate Agency in Frankfurt. The Porta Mondial Group is further expanding its network in the Rhine / Main area and is now present at another Top 7 location in Germany with Frankfurt. 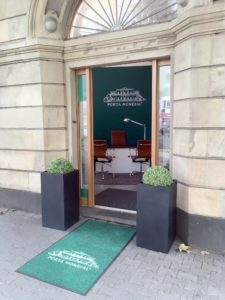 The new real estate agency is located in the best city location in the Westend, in the Fellnerstraße 14, on the corner of Eschersheimer Landstraße. The Porta Mondial franchise partners in Frankfurt, Marco di Benedetto and Florian Tretter, are pleased to welcome and advise their customers in the well-maintained, renovated old building constructed in the 19th century, with a view of the Eschenheimer Tor. Marco di Benedetto describes the location. Thanks to their well-functioning network, the two real estate experts had no problems finding suitable office space in this coveted city location. Florian Tretter explains. The two managing directors of Porta Mondial Frankfurt have expanded their business field with the acquisition of the Porta Mondial franchise licence, and now offer their customers a full-service package for all real estate matters: from purchase, sale, rental to complete property management. The wide range of Spanish holiday properties from the international Porta Mondial network complements the portfolio, and differentiates the real estate agents from the competition. In addition, the two have many years of experience in project development, and are also active in marketing for newly constructed buildings. Due to the high demand for real estate in Frankfurt, only a few properties can be found on the website https://www.portamondial.com/frankfurt/, but are mostly marketed directly within the circle of interested parties. Florian Tretter therefore advises interested customers to make direct contact, either by telephone under 069/595 561 24, or by email at frankfurt@portamondial.com. The real estate agency of Porta Mondial Frankfurt is open from Monday to Friday from 9am to 1pm, Monday to Thursday from 3pm to 6pm, and on Saturdays by appointment. With Frankfurt am Main, Porta Mondial has opened their ninth location in Germany, while in Spain, the estate agency franchise is represented by 11 branches.